Monounsaturated oils are a heart healthy oil and considered an essential component of a healthy diet. American hazelnut is 81% oleic acid, making it one of the healthiest oils available. Researchers are just beginning to explore the diversity of American hazelnut populations and it is likely there will be as many variations in flavor and color as there is with wine. As such, there is great potential for growers in the Upper Midwest to create a source-identified differentiated product that can expand the pallete of American consumers, improve heart health, and put money in the pockets of growers. Direct marketing of specialty hazelnut oils will likely be the first entry point for marketing Upper Midwest hazelnuts. As production volumes grow and per unit production costs decline, growers will be able to access larger processing markets. ​The same high oleic acid that makes hazelnut oil a superior eating oil, also makes it a superior feedstock for biodiesel and other bio-industrials. Hazelnuts grown in Nebraska have shown the potential to yield twice as much oil per acre as soybeans. 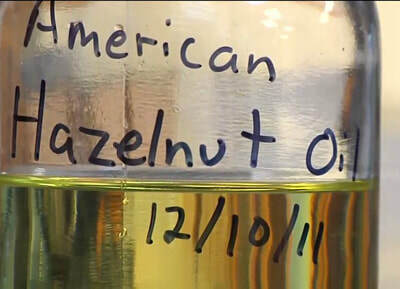 American hazelnut oil, in particular, is 81% oleic acid. The high percentage of unsaturated fatty acids results in a biodiesel with a cloud point of -19.3C compared to soybean derived biodiesel with a cloud point of -2.9C (Lane et al, 2012). Most importantly, the perenniality of hazelnuts improves its sustainability through higher net energy gains and reduced soil erosion and nutrient loading in surface and ground water. Hazelnut has the potential to be the first perennial oilseed crop for the Upper Midwest and could greatly improve the sustainability of biofuel production. Researchers and policy-makers are struggling with the coming challenge of feeding the world's population, which is expected to reach 9 billion people by 2050, without further degrading the soil and water on which we all depend. 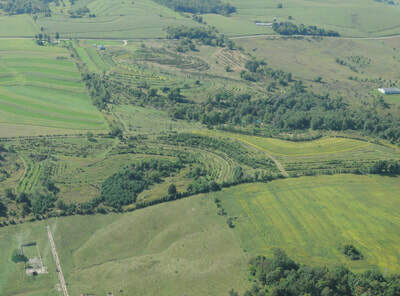 An exciting area of agricultural research centers on the important ecological concept of niche space utilization. In natural systems, often by random chance, plants and animals will exist where they can survive and reproduce. This typically results in a great diversity of plants and animals in any given geographic space. 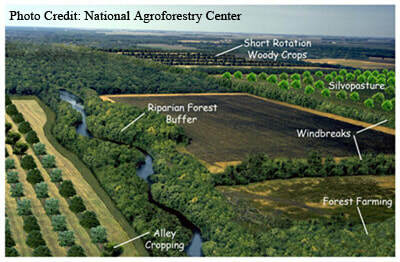 A tropical rain forest or tallgrass prairie are great examples. If all of the various habitats (canopy layers, rooting depths, growing seasons, etc) are being utilized, then the system as a whole can be quite productive. By applying this concept to agriculture we might be able to increase productivity while also doing a better job protecting soil and water. The oak-savanah biome is a great model for designing agricultural systems in the Upper Midwest that maximize niche space utilization. A carefully designed mix of nut producing trees, fruiting shrubs, grain producing grasses and legumes, and livestock might very well yield highly productive systems. Hazelnuts are envisioned as a foundational species for such systems and are included in a number of "natural systems agriculture" trial plantings being established across the Upper Midwest.